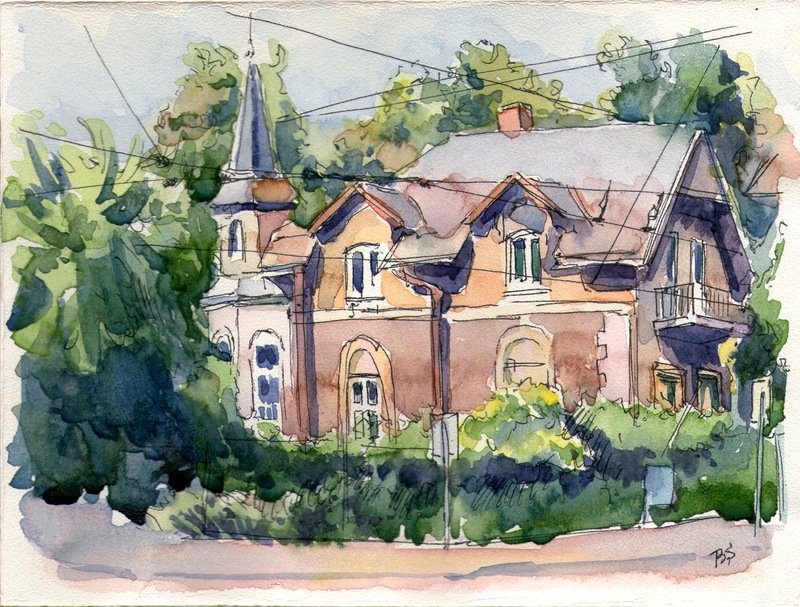 WATERCOLOR TUTORIAL: "Painting A Countryside Mansion"
This is a watercolor painting of a beautiful countryside mansion. I have attempted to not just depict the rural setting but also to capture the atmosphere around. Without mood and atmosphere paintings appear dull and lifeless and it must be an artist’s constant endeavor to breathe life into their work as opposed to merely reproducing what they see. I start with the drawing. With buildings and structures it’s important to get the perspective lines right so I pay close attention to the direction of my lines. I suggest the edges of the foliage and the tree trunks without getting into too much detail. I should’ve stopped to take a picture but I got carried away and hence do not have a picture of the finished drawing. My apologies, but you get the general idea, don’t you? Let’s move on to the first washes. Since I like to always start with the point of interest I decided to work on the mansion first. I mix fairly thick washes of Ultramarine Blue and Alizarin Crimson separately on my palette and wet the shadow sides of the building paying careful attention to leave the tree trunks dry. I made sure I had a broken edge at the bottom which will serve as the top edge of the bushes. I also wet the roof area but I leave a dry line to separate the roof from the walls. I drop in the Blue mix on the shadow side and the Crimson one on the roof. On a wet surface, always try to allow paint to flow from the brush to the paper rather than scrubbing in the pigment. While the washes are still wet, I drop in some warm Burnt Sienna into the cool Blue wash to create some variety. I also paint in the shadow cast by the edges of the roofs on the sunlit sides of the building and introduce a tree shadow on the wall near the front door. I quickly paint in the dark shape inside the door carefully carving out a negative figure by leaving some areas unpainted. Some artists save the details for the end. I sometimes take that route too. But in most cases, I focus my energy on getting the point of interest right at the very outset because if you fail there, it does not matter how good the rest of the painting is and you’d have no choice but to throw away your work. This is precisely why most portrait artists start with painting the eye. I wait for the shadow washes to dry and start working on the details. I mix a thick wash of Burnt Sienna and Prussian Blue and use a rigger brush to paint in the details on the roof and on the walls of the mansion. It is in such situations that your brush drawing skills come in handy. Make sure you go for a bit of ‘hit and miss’ with the lines. We do not want to create an architectural drawing! We are after an impressionistic representation of the scene. I am pretty happy with how the mansion has shaped up and decide to move on to the background and the sky. I wet the entire sky area all the way down to the horizon and drop in some Cobalt Blue. Note how the pigment spreads and forms negative shapes that look like clouds.I bring a weak wash of violet/blue down to the top of the bushes on the right. I will eventually paint some bushes and the tree foliage over that area. While the sky wash is still wet I quickly prepare a thick wash of greens and drop it just above the horizon line to the left. This shape creates the impression of background trees. The pigments used are Sap Green, Prussian Blue and Gamboge. I continue to work on the background and use the same mixture from the previous step to paint in the trees towards the right side of the painting. I also do some brush work to create the bushes. The broken negative shape serves as the edge of the bushes and I use some dark greens to paint the shadow side. You can see that I have left the paper white in certain areas and they tend to look like sunlight falling on the leaves. Yet again, I make sure the tree trunks are left untouched. The low wall-like structure right above the horizon, to the left, is a weak wash of Raw Sienna with some Burnt Sienna dropped into the bottom edge. Let’s work on the trees now. I wet the entire foliage area and prepare a thick mix of Sap Green and Prussian Blue on my palette. I use the belly of the brush to drop in the pigment on the wet surface and it spreads creating clumps of foliage. Then, I use the brush drawing technique to quickly paint some leaves along the periphery which I left dry in the first place. Please make sure you resist the temptation to overdo this. A few leaves are all it takes to create the impression that every single leaf has been carefully painted. Remember, our job is to trick the viewer to finish the painting in their mind. So make sure you leave a lot of room for imagination! Before the foliage area starts to dry, I use clean water to wet the tree trunks. I pick up a mix of Burnt Sienna and Raw Sienna and using the chisel edge of a flat brush lay in a quick downward stroke on the bigger tree trunk. Make sure this is off-center. Using a damp brush, I spread some of the wash that I just put in to the shadow side. Notice how this created the impression of strong sunlight falling on the tree trunk. I adopt the same technique for the thinner tree trunk and then drop in a dark mix of Prussian Blue and Burnt Sienna on the top portion of the trunks. These dark portions serve as shadows on the trunk cast by the foliage. I use a rigger brush to paint in some branches. Like I said, please do exercise self control. A lot of thin branches growing in all directions would make the tree look unnatural. The key is to understate! As the washes begin to dry, I make some random horizontal marks to depict texture on the bark of the trees. At some places, I use a wet brush to lift out lines, paying attention to the shape and roundness of the trunk. Make sure these are not equally spaced. The bushes in the middle-ground look rather flat to me. I decide to do some moulding by using the tip of a Size 12 round brush and a mix of Sap Green and Burnt Sienna. A few random dots and patches will do the trick as you can see. Never paint every single leaf or blade of grass. You had a chance to do that back when you where in Elementary School and I hope you did put that opportunity into good use! I work a bit on the low wall to the left using a rigger to make some marks indicating texture. That part of the painting is in the background and you do not want to put in too many details in order to make it pop. The viewer is expected to look at the mansion. Everything else is just the supporting cast. As the next step, I paint in the shadow side of the human figure at the door with a quick single stroke of my Size 12 round brush dipped in a weak mix of Crimson which I prepared for the roof. Bold strokes create more convincing shapes and elements. Always try to achieve what you want with as few strokes as possible. Before I move on to the foreground, I use my Rigger to paint in some tree trunks over the background foliage to the right. Notice how I varied the colour and the value (intensity) in order to create distance and depth. Next, I wet the entire foreground area with a large brush dipped in clean water and drop in a weak wash of Raw Sienna. I introduce some Ultramarine Blue into the mix towards the bottom edge of the paper. Before I move on to the final step, I wait for the foreground wash to dry completely. Then, I use a 3/4″ flat brush loaded with a watery mix of Ultramarine Blue and paint in the foreground shadows. While the wash is wet, I drop in some Crimson towards the bottom edge to create some variety in the shadow shape. Once this is dry, I use a Rigger brush and some thick Burnt Sienna to paint in some random dots and lines in the foreground. This creates texture and makes it appear like you are looking at fallen leaves and such. Here’s the final painting for you. Hope you enjoyed this tutorial. I shall be back with another one soon. So long. Take care and happy painting. Sujit Sudhi is a watercolour artist living and working between Kochi, India and Kenosha, Wisconsin, USA. His work has been displayed in galleries across the United States and his painting titled ‘Morning Light’ appeared in the 18th edition of the North-light books publication titled Splash, which features the work of the top 120 watercolour artists in the world. You can visit his website by clicking here! Thank you very much for this wonderful tutorial! The light you achieved is beautiful, and the trees have a wonderful glow. I look forward to your next tutorial! Sujit, it was fascinating watching your mansion appear. Thank you for showing us how to do this! Thank you for sharing this tutorial. Can’t wait to try it. Thank you so much sir for the description I am admire your paintings absolutely and always wonder how to paint like you. I am so grateful at the moment after reading this tutorial. I will try this painting exactly the way you showed. Thank you for this post and all the details for each step. Helps a novice in water colors like me! Thank you so much for this tutorial Sujit – I’m anxious to give it a try! Hello Sudit! This tutorial just came at the right time. My goal for this summer is to learn more about this wonderful medium that is watercolor. I got to work right away with your tutorial. Looking forward to the next one. Thank you for your generosity in sharing. Diane. Love this, great explanation, I am working on my first attempt now. I will post a pic here of it when done, but how do I do that? Sujit, I appreciate your detailed tutorial! Beautiful painting! Thank you thank you thank you!!!!!!!!!!!!!!!!!! I loved this! And learned SO much by following your steps! Now am looking for the tutorial you did with the boat!